Teeth whitening is the most popular cosmetic dentistry treatment in America. Many men and women have teeth that have become yellow and discolored due to years of drinking coffee, tea, and wine. In addition, the natural aging process means that teeth turn darker over time even if you've never touched a food or drink that could stain the teeth. Here at Cosmetic & Esthetic Dentistry, experienced cosmetic dentist Dr. Ryan Clancy offers both in-office and take-home whitening solutions for our Boston patients. If you are interested in teeth whitening, call us at 781-396-8558 today to schedule your consultation. We use the Opalescence Boost power whitening system for in-office teeth bleaching, and we also offer customized take-home trays for maintenance. The Opalescence system utilizes a chemically activated gel that can brighten teeth up to 10 shades in just 40 minutes, and is able to remove both surface stains and deeper stains. 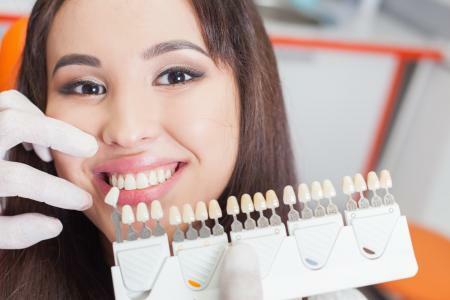 Professional in-office tooth whitening ensures greater safety for the gums and more evenly treated teeth than is possible with over the counter tooth whitening systems. In addition, in-office whitening gel is much more powerful, meaning that you can see greater results in less time. Although Opalescence Boost contains desensitizing ingredients, tooth sensitivity may occur after treatment. This is a common side effect, and unfortunately there is no way to know beforehand if a patient will experience extreme sensitivity or not. Luckily, enhanced sensitivity generally only lasts for a few hours. We will prescribe medication for patients who experience worse than usual sensitivity. Since teeth whitening can result in some tooth sensitivity, if you already have teeth that are very sensitive, you should probably not undergo teeth whitening. In addition, if you are a heavy smoker, you will not see long-term results. Teeth whitening can certainly lighten your teeth even if you are a smoker, but if you cannot quit smoking or reduce the number of cigarettes you smoke, your teeth will inevitably become stained again. Gum disease and tooth decay will need to be treated before you can undergo teeth whitening. If your tooth decay is extensive, you may need a full restorative plan that includes dental crowns and fillings. Teeth whitening can be used to match the rest of your natural teeth to the shade of your restorative dentistry work, though. For maintenance with an at-home whitening tray, we recommend getting a custom tray created in our office over buying one over the counter. This is because a tray customized to your teeth will give more effective and even results, and lessens the chances of irritating your gums since it's designed specifically for your mouth. It is a myth that teeth whitening will make your teeth brittle and weak. Professional whitening does not harm tooth enamel when performed properly, and it does not alter the structure of the tooth in any way. The majority of our patients are very happy with their tooth whitening outcomes. If you are interested in quickly and safely lightening your teeth, call Dr. Clancy today at 781-396-8558 to schedule your consultation. We serve patients in Medford, Winchester, Somerville, Cambridge, and other areas of greater Boston.